I was just telling a friend the other day how much I like homemade baked pretzels, and I figured some of y'all might be interested in the recipe as well! I've been making this recipe from Alton Brown for a few years now, and it has never disappointed. The directions call for using a stand mixer, but there's no reason these couldn't be mixed and kneaded by hand if you were so inclined. 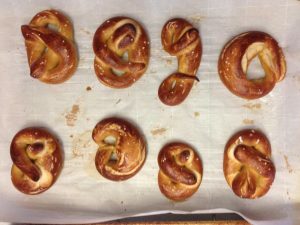 Authentic baked pretzels are boiled in lye, but the baking soda/water mixture in this recipe works pretty darn well and involves a lot less in the way of safety precautions. Combine water and granulated sugar in the bowl of a stand mixer and sprinkle the yeast on top. Let sit for 5 minutes (or until the mixture begins to foam). Add flour, kosher salt, and butter. Using the dough hook attachment, mix on low speed until well combined. Then change to medium speed and knead until the dough is smooth and pulls away from the side of the bowl, approximately 5 minutes. Remove dough from the bowl, clean the bowl, and then oil it well with vegetable oil. Return the dough to the bowl, cover with a towel, and let sit in a warm place for 50 to 55 minutes--or until the dough has doubled in size. About 20 minutes before the end of the rising time, preheat oven to 450°F. (My oven runs a bit cool, so I set it to closer to 475°F. The pretzels won't brown well if your oven isn't hot enough.) Line two large cookie sheets with parchment paper. Also before the end of the rising time, bring 10 cups water and baking soda to a rolling boil in a large saucepan. When dough has finished rising, turn it out onto a slightly oiled work surface and divide into approximately 16 equal pieces. (Alton suggests 8 pieces, but I find that to be so large it's pretty much a meal in and of itself. Since I usually bring these pretzels to gatherings where other food is served, I opt for a smaller size.) Roll out each piece of dough into an 18-inch rope (estimating is fine here--no need to get out a ruler!). 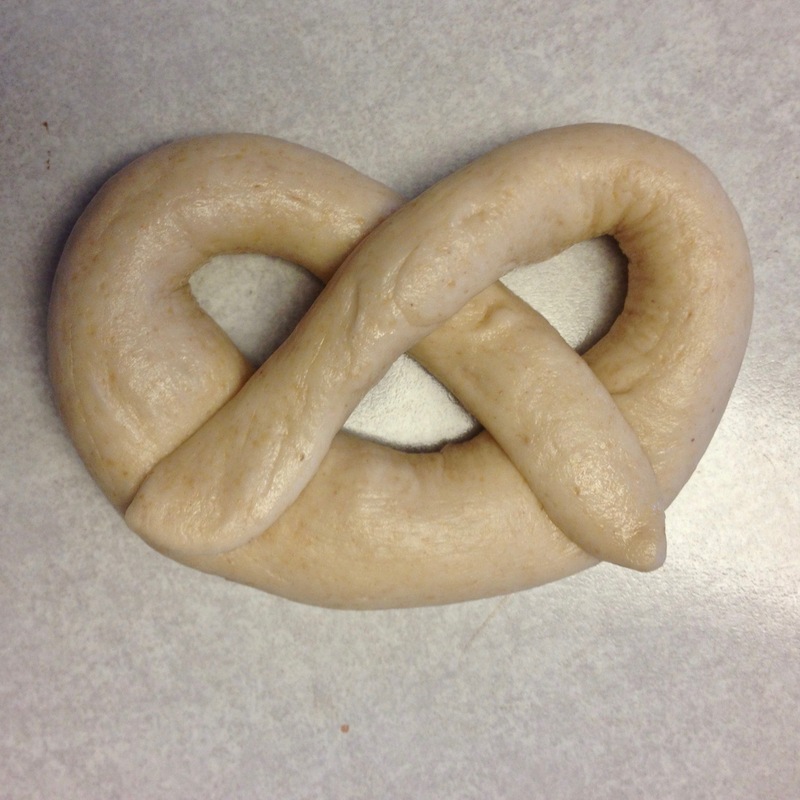 Make a U-shape with the dough rope, then hold the ends and cross them over each other. Press the dough ends firmly onto the bottom of the U-shape so that the pretzel will hold its shape. Or feel free to experiment with other shapes--just don't get too intricate, and it'll be fine. You can either shape all your pretzels at once or alternate shaping them and boiling them. Or enlist child labor helpers to help shape the dough. 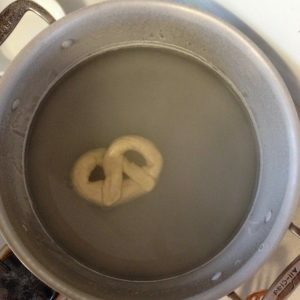 Place the pretzels into the boiling water, one at a time, for approximately 30 seconds. (I've gotten distracted and left pretzels in the water for far longer than this; they still turn out fine.) Remove them from the water using a slotted spoon (Alton Brown suggests a large, flat spatula for this, but I prefer my trusty spoon). Place pretzels on the lined cookie sheet, leaving 1.5" to 2" between pretzels. 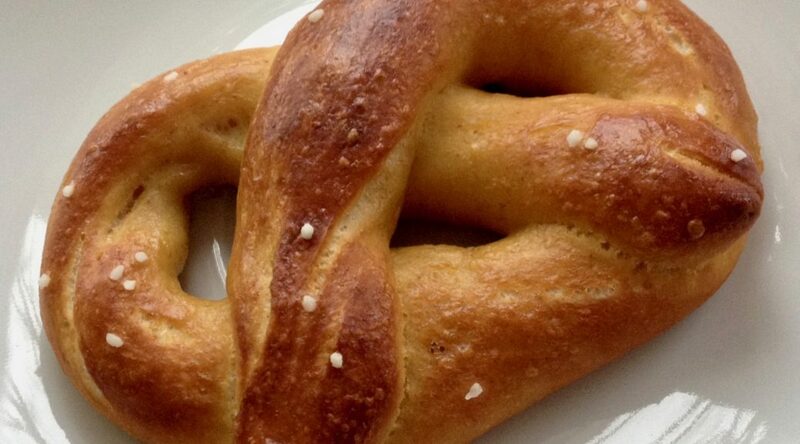 Brush the top of each pretzel with the beaten egg yolk and water mixture and sprinkle with the pretzel salt. Bake until dark golden brown in color, approximately 12 to 14 minutes. (Don't chicken out and remove these from the oven too early--you want them to get fairly dark.) Transfer to a cooling rack for at least 5 minutes before serving. That said, I can't imagine being so inclined as to work this by hand. Someday I'm gonna get a stand mixer, and then... there will be pretzels! Doing it by hand is nothing all that crazy. After adding the flour, kosher salt, and butter, you'd use a wooden spoon or large-size spatula (I have a silicone one with a wooden handle I really like) to mix the dough until it's combined into a sort of shaggy mass. Then dump it onto and oiled countertop and knead by hand for something like 7-10 minutes until the dough is smooth and has a slight sheen to it. And then let it rise as directed in the recipe. There's something really satisfying about kneading it by hand. If you're using the right technique, it's not even all that tiring. Only 7 - 10 minutes? I guess I always think of a stand mixer as being dramatically more effective than by hand. Think of it in terms of standing there kneading for 10 minutes, or watching a stand mixer do it while you drink a beer. You know what would be good with my beer? Pretzels. Yes and no. I do like kneading bread (when I am not no-knead, which is most of the time). the boiling/extraction activity sounds like a job for a spider. Oooh, that would be the ideal tool for the job. 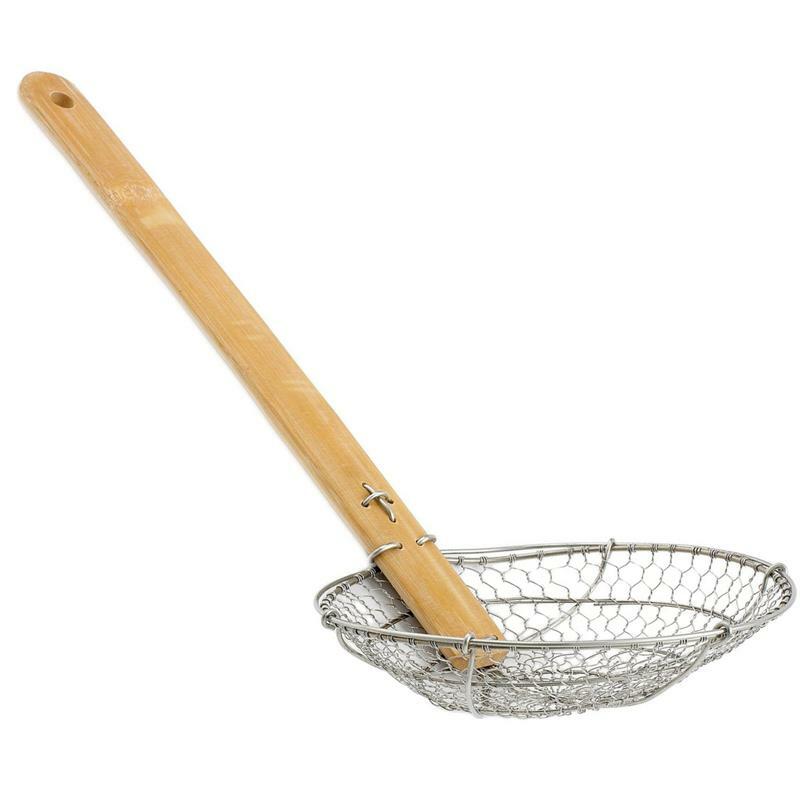 Also good for flipping donuts in hot oil. Or retrieving pretty much anything from hot oil.